A Samsung smartphone caught fire mid-air on a Delhi-Indore flight last Friday, sending dozens of people in panic as the alert crew rushed to put the situation under control, according to a report. The Jet Airways' flight had 120 passengers onboard and it eventually landed safely. The handset, said to be a Samsung Galaxy J7, belonged to a Delhi resident Arpita Dhal. The phone, she says, was in her bag, which she had placed under her seat. About 15 minutes after the flight took off, she told HindustanTimes, that smoke started coming out of the bag. "It was a mid-air panic. We prayed to god," said Arpita's husband Atul told the newspaper. Adding more stress to the situation was the fact that the fire extinguishers that did not work, the couple said. The crew, however, handled the matter responsively, quickly moving to a different plan. They put the handset in water to stop the smoke and any potential explosion. "Jet Airways crew immediately took charge of the situation, as also all necessary steps as precautionary measure, and as per the prescribed guidelines," a Jet Airways spokesperson told HindustanTimes. Gadgets 360 has reached out to Samsung to comment on the issue. Samsung has been under stress over the past year over the Galaxy Note 7, with its battery responsible for fire hazard issues and the subsequent recall. The company had to ban the Galaxy Note 7 smartphone last year after several incidents of the handset catching fire and bursting into flames. 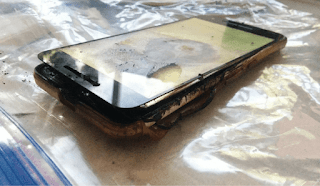 Earlier this month, another Samsung smartphone was caught catching fire in Indonesia, and at the time, the company had blamed use of a third-party battery.